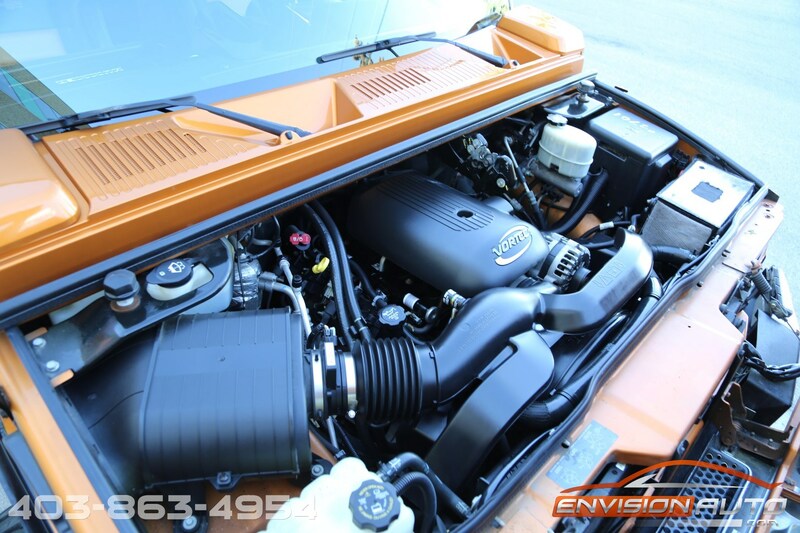 Color : – Fusion Orange Metallic Ext. 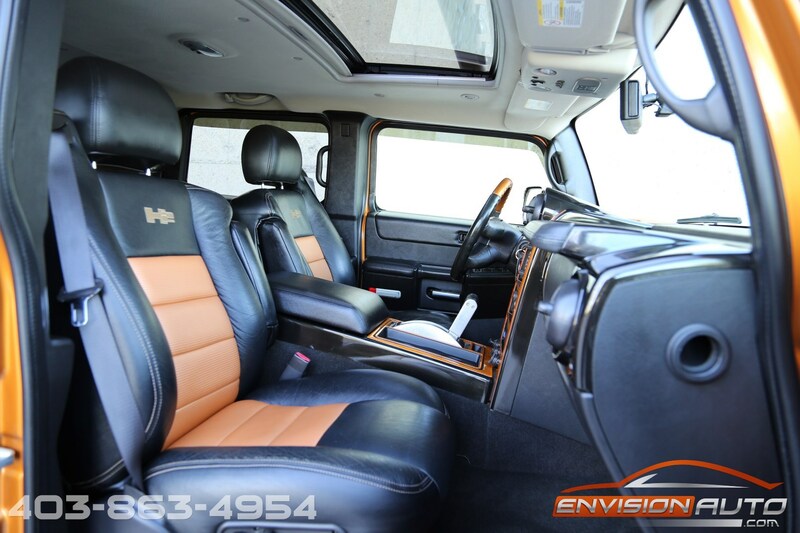 w/ Black Custom Leather Int. 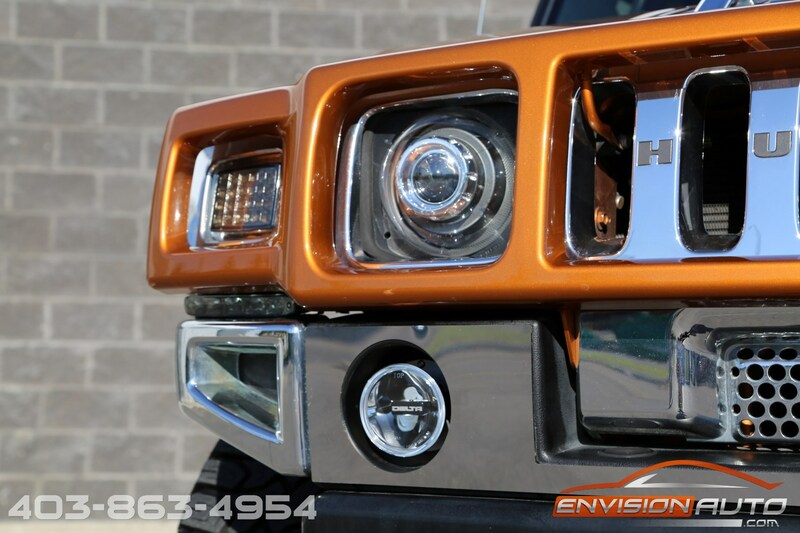 -> RUST FREE FLORIDA HISTORY! 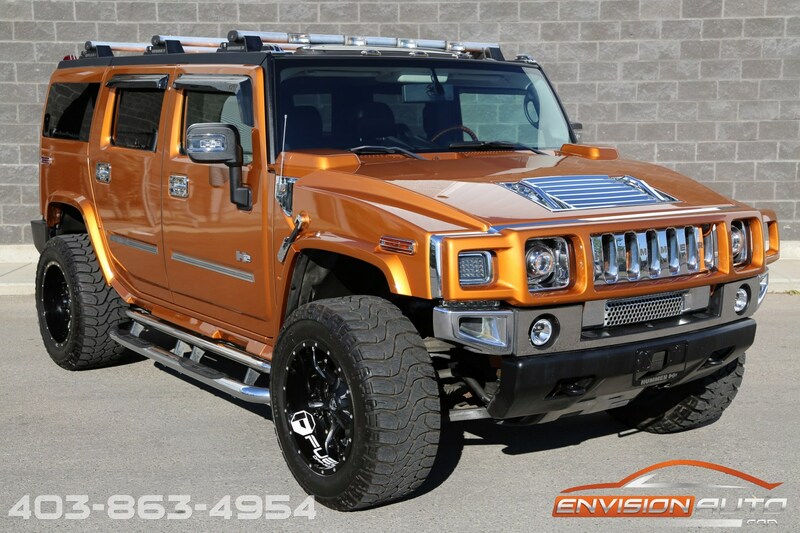 ABSOLUTE STUNNER! 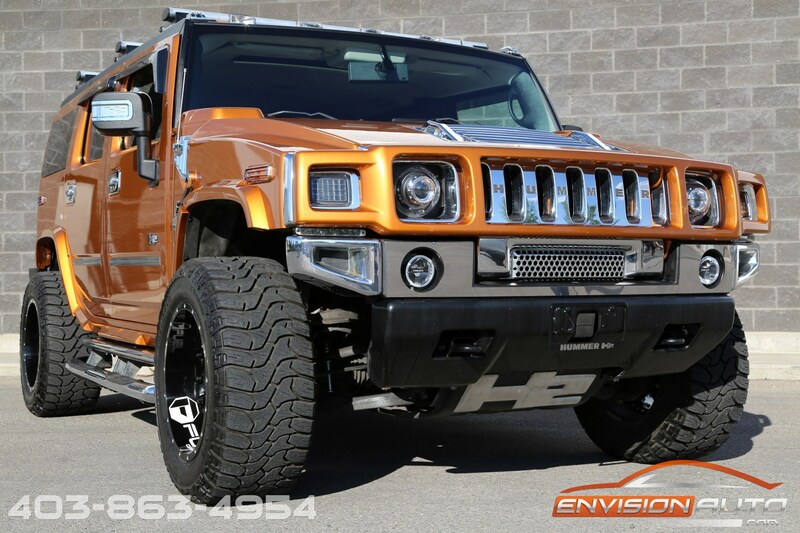 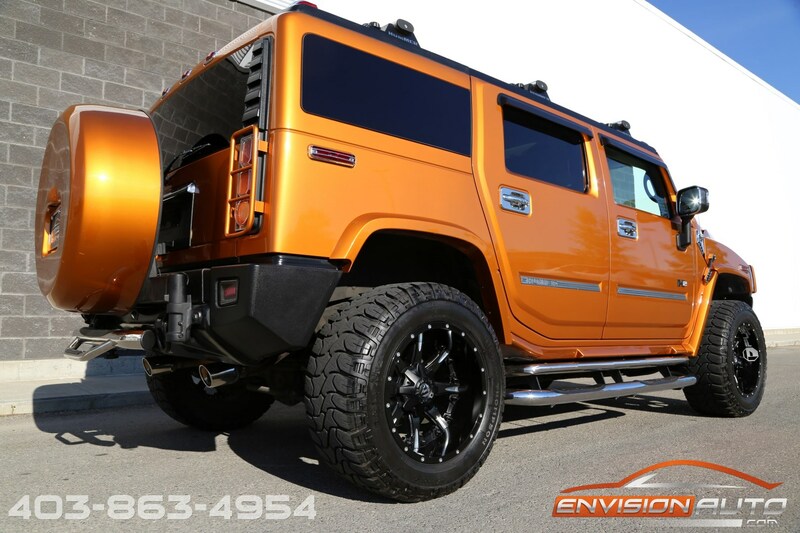 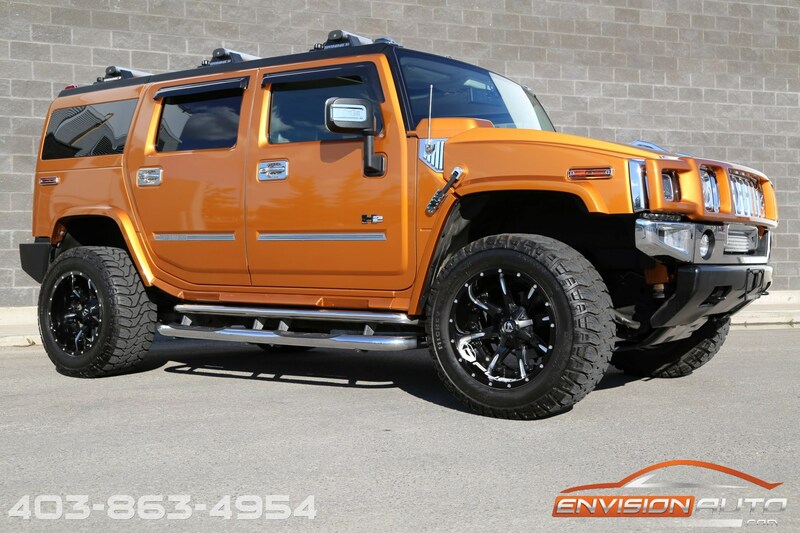 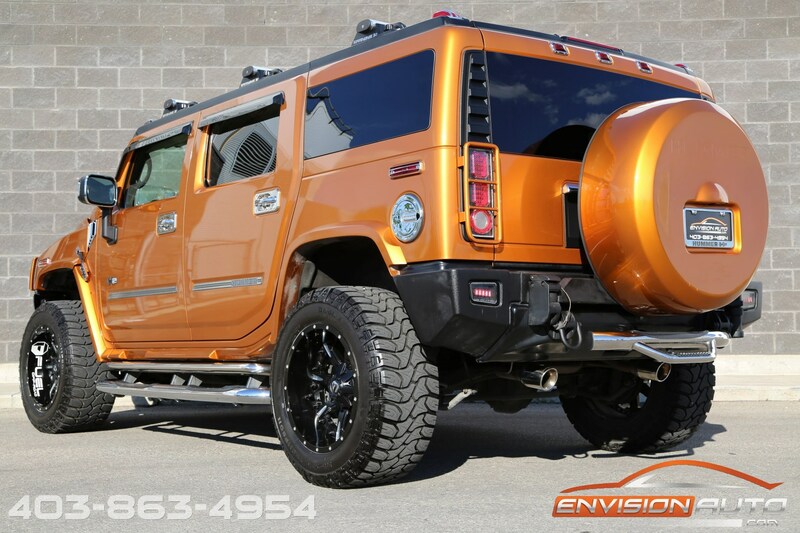 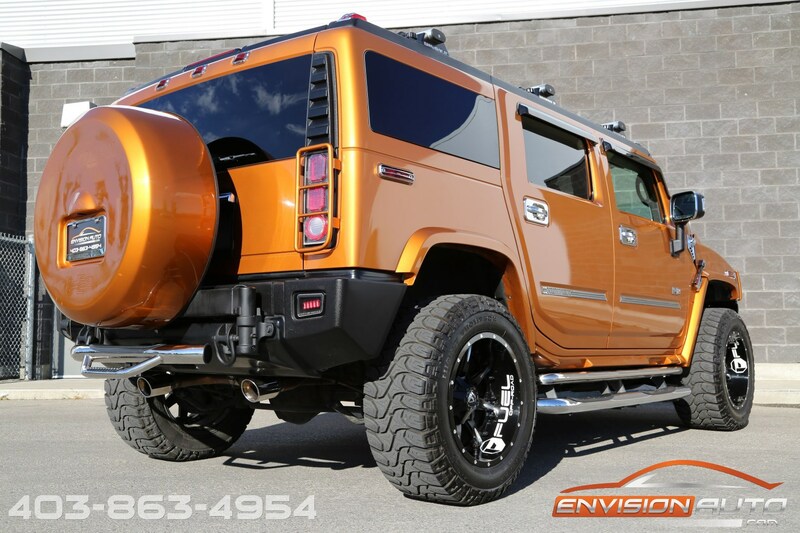 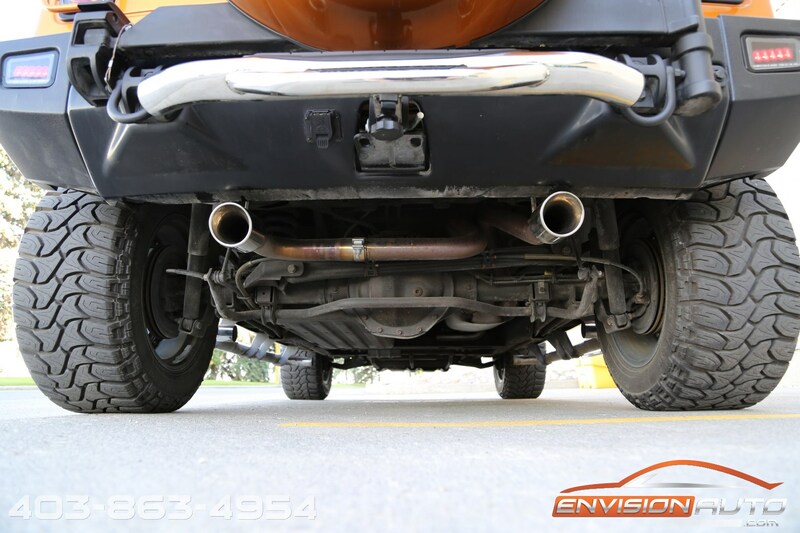 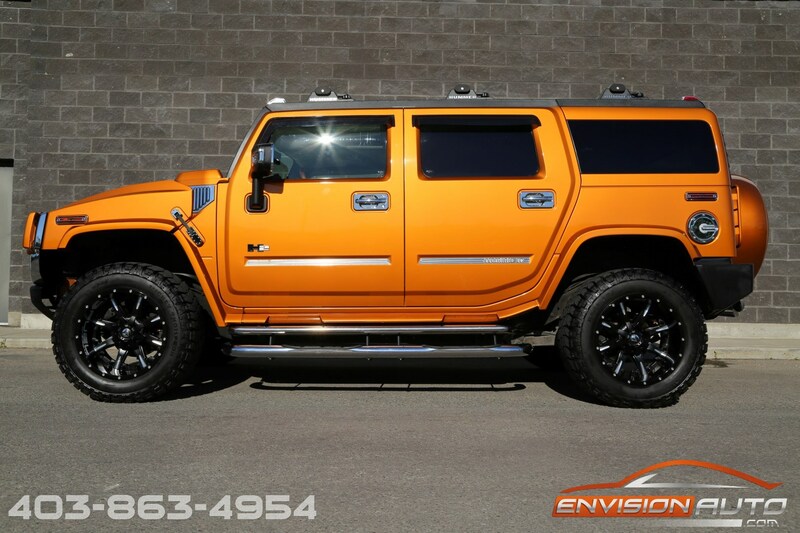 FUSION ORANGE H2 LIMITED EDITION SHOWTRUCK – HUGE OFFSET CUSTOM 20 INCH FUEL NUTZ WHEEL PACKAGE – UPGRADED HID/LED LIGHTS THROUGHOUT – CUSTOM CHROME ACCENTS THROUGHOUT – RUST FREE FLORIDA HISTORY – FULL CUSTOM LEATHER INTERIOR – DUAL MAGNAFLOW EXHAUST – 100% SPOTLESS CARPROOF HISTORY REPORT – ONLY 117,500 KILOMETERS – COMPLETE 300 POINT SAFETY INSPECTION JUST COMPLETED!!! 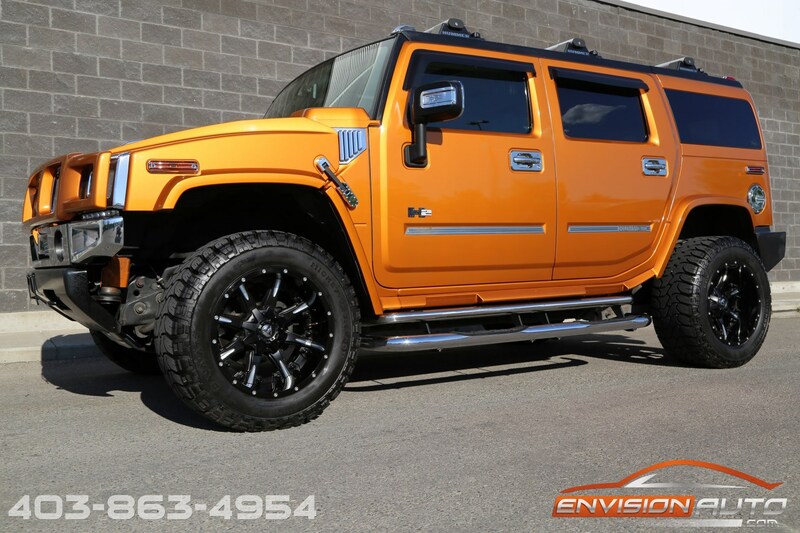 Absolute ONE OF A KIND! 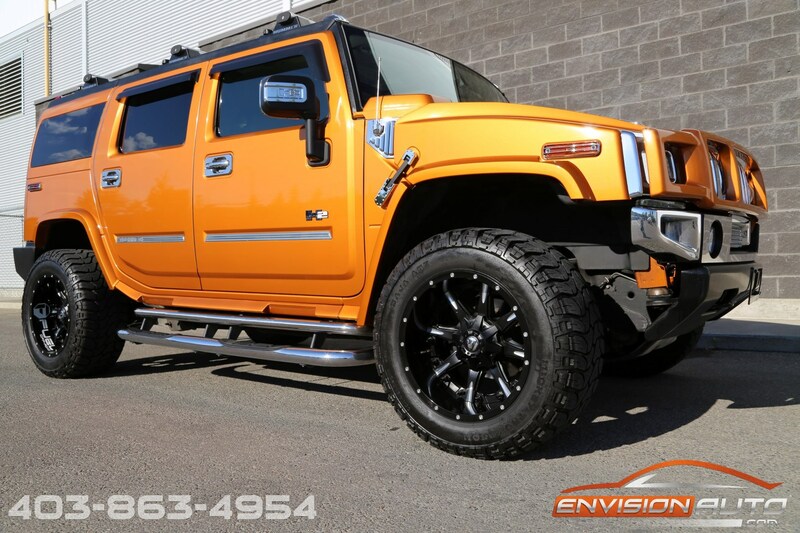 If you are looking for that one unique truck to stand apart in the crowd, this is THE ONE! 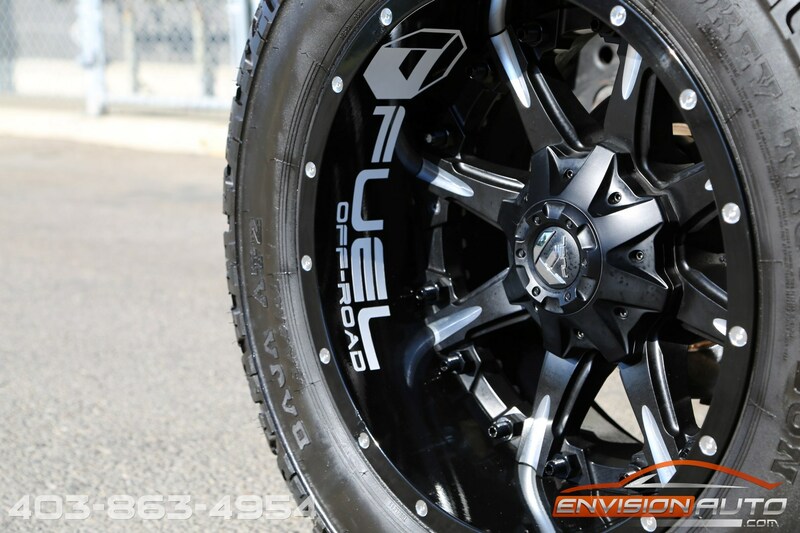 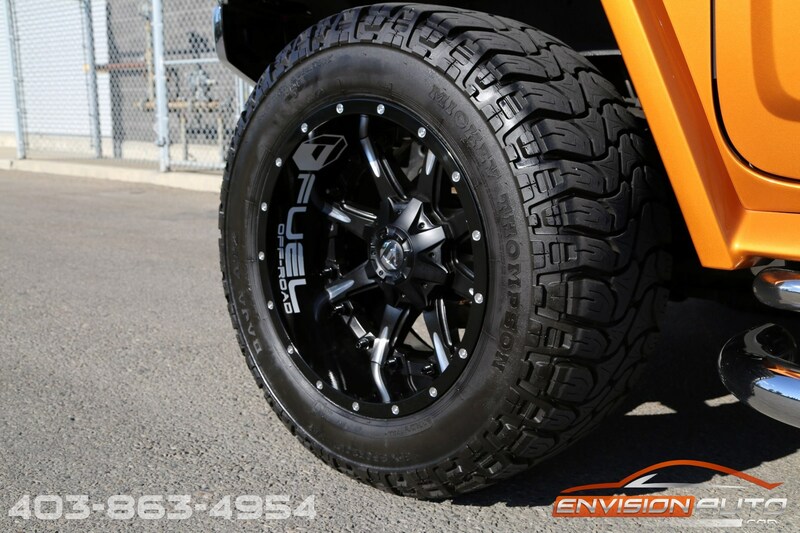 Starting off with a 20 inch Fuel Offroad Custom Wheel Package with a huge offset and riding on a brand new set of Mickey Thompson Baja ATZ 35 x 13.50 x R20 tires gives this truck a stance like none other. 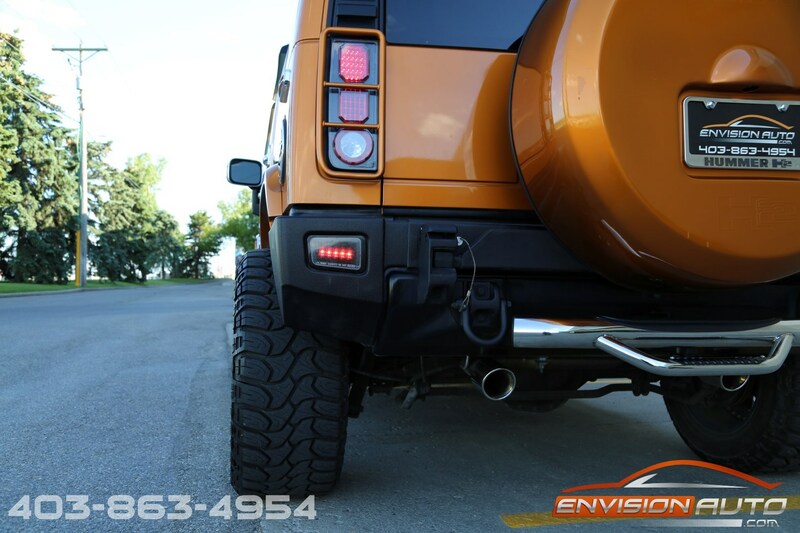 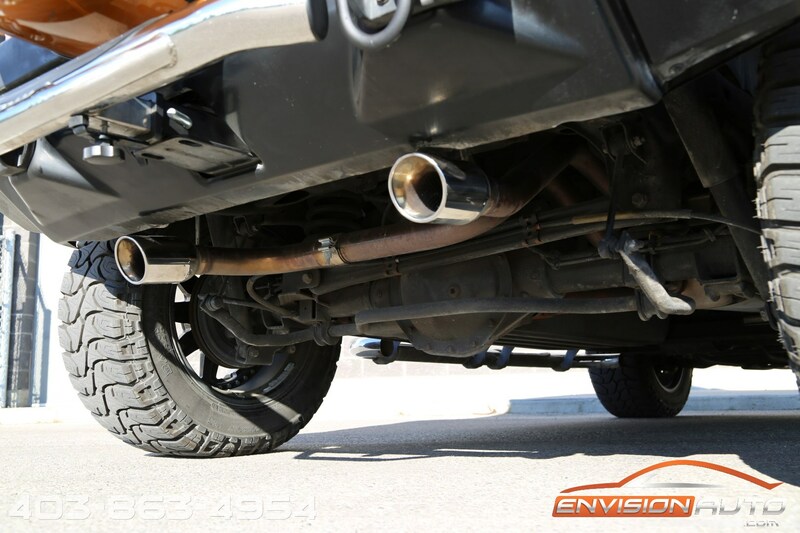 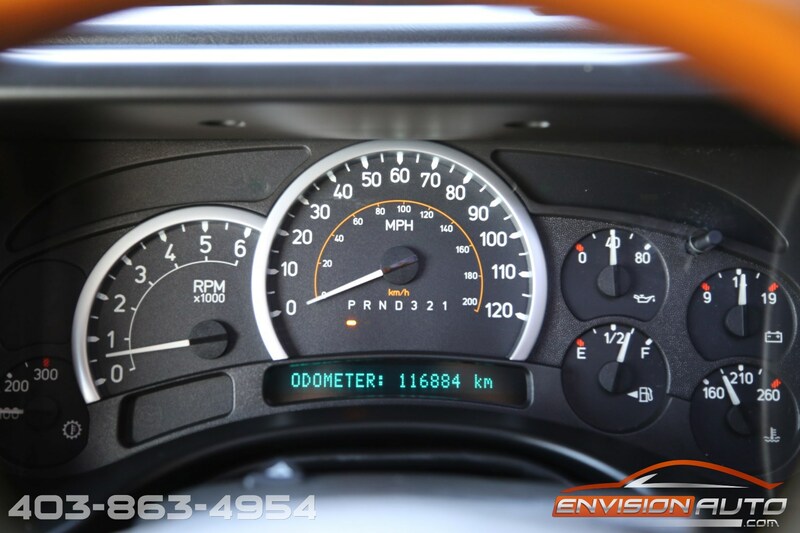 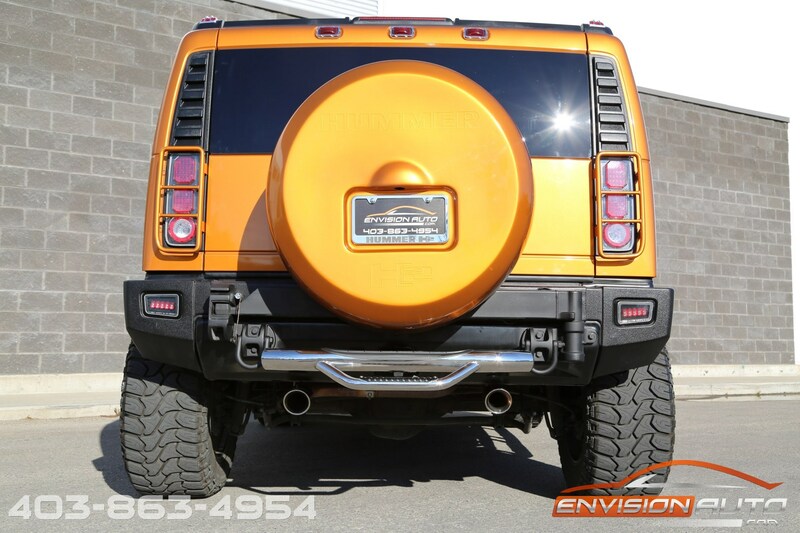 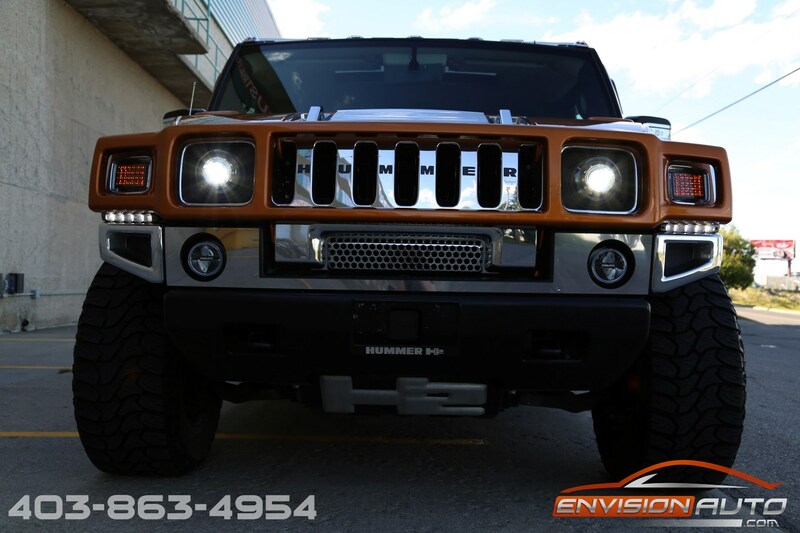 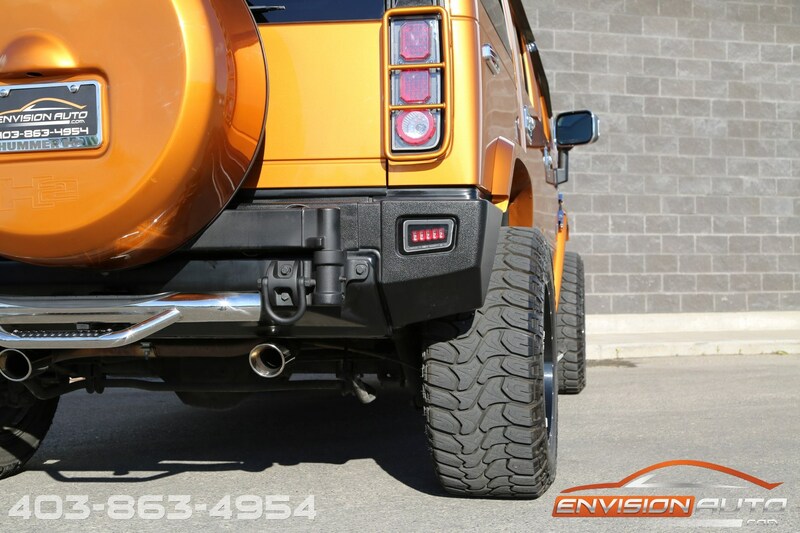 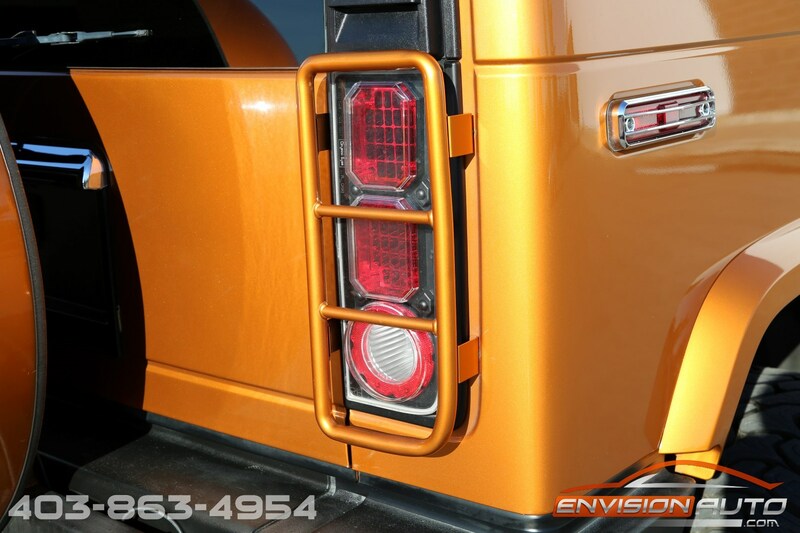 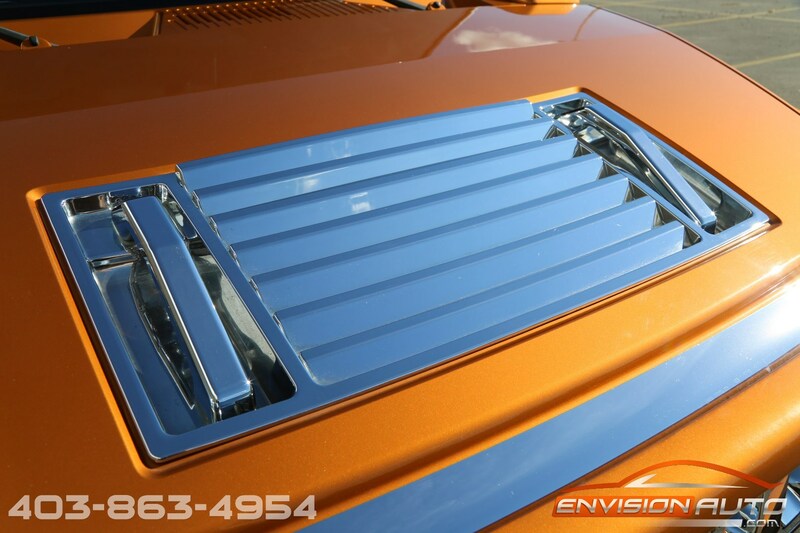 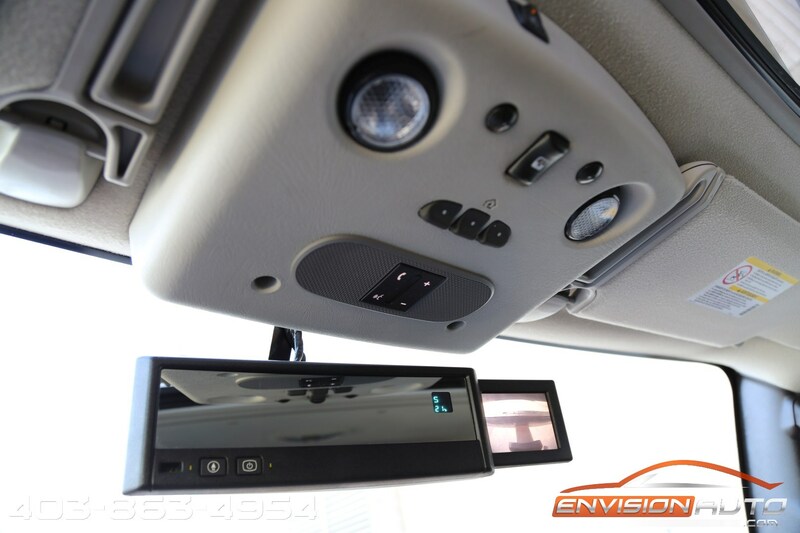 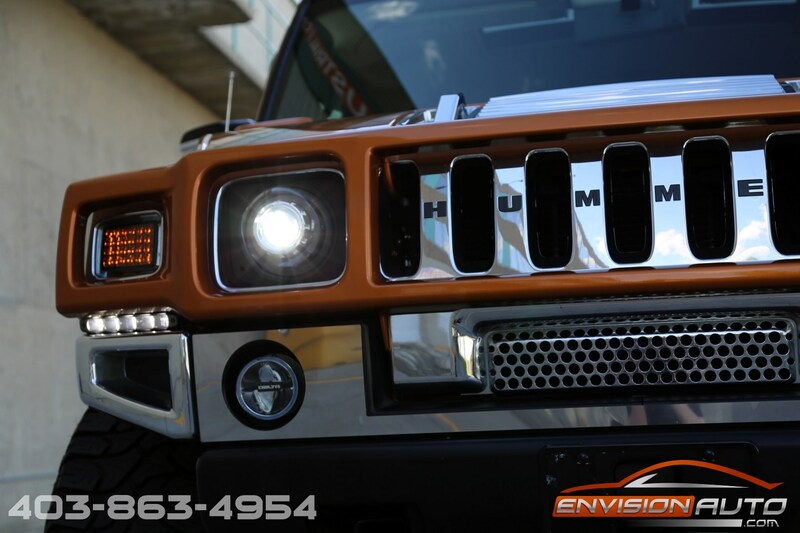 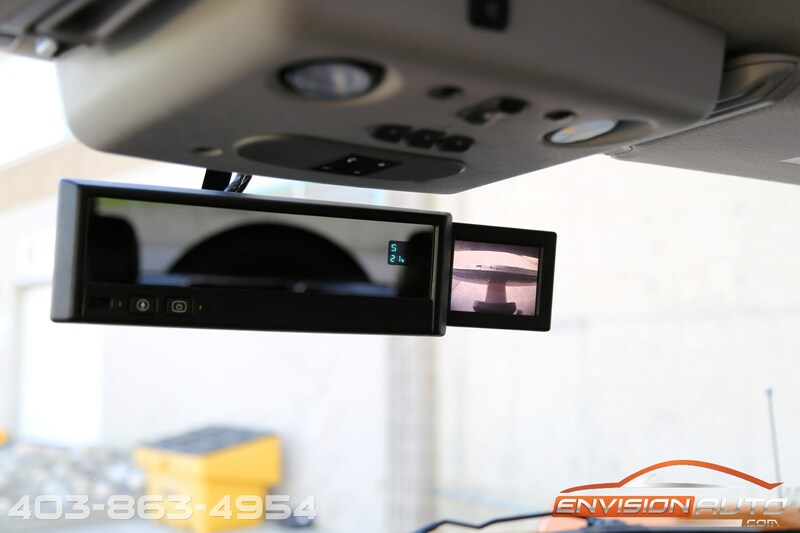 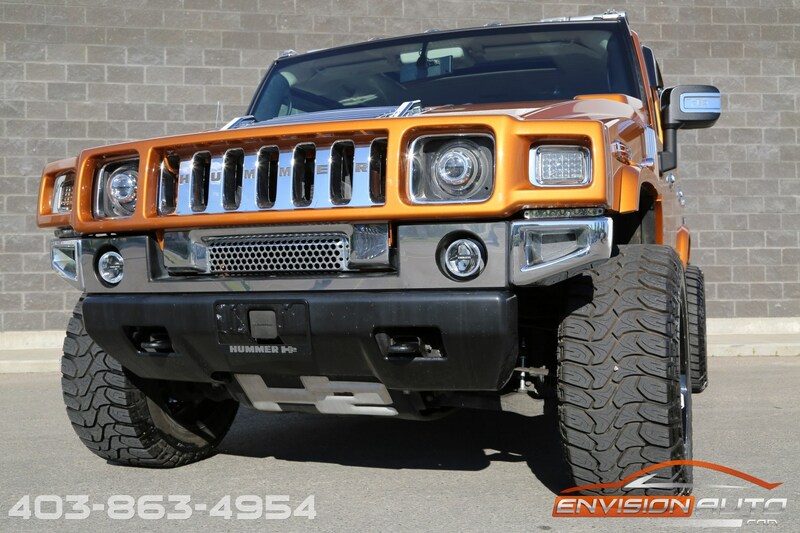 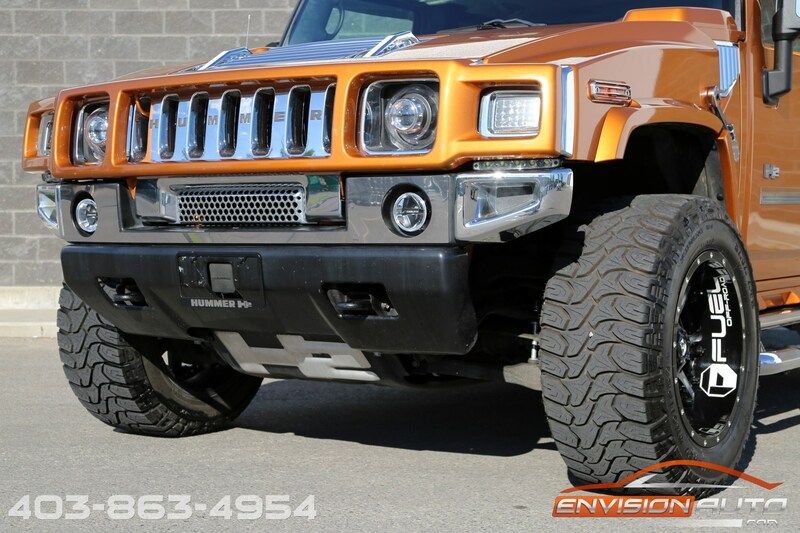 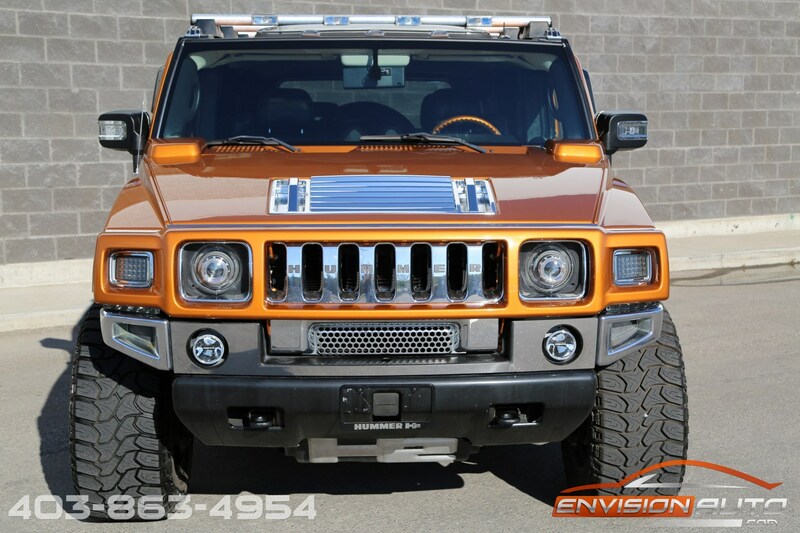 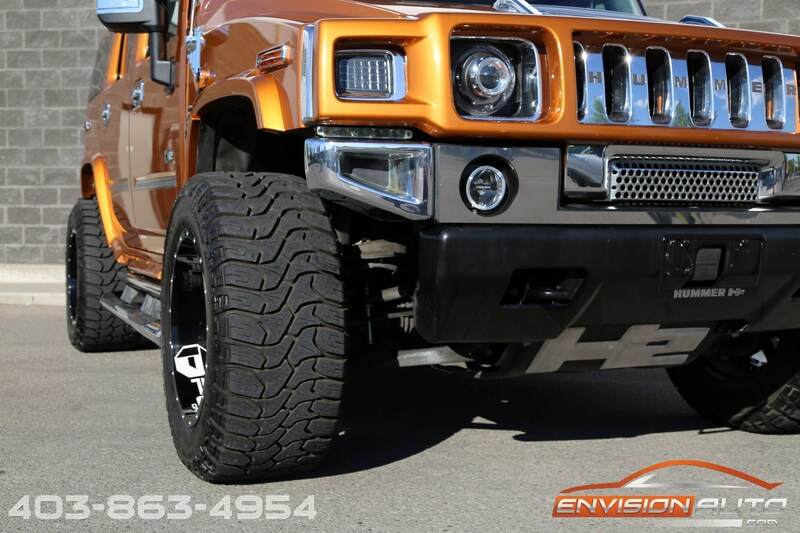 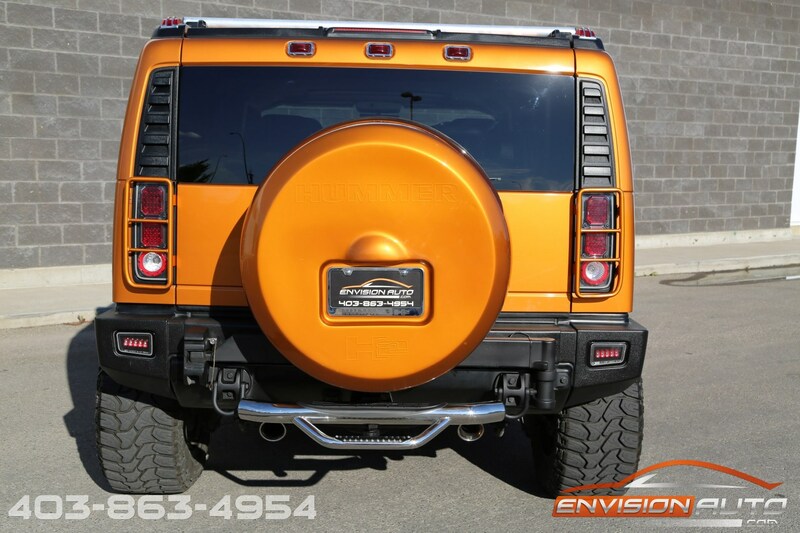 Fully customized lighting package features upgraded full replacement HID headlights, HID running lights, LED running lights, and LED tail lights and LED marker lights. 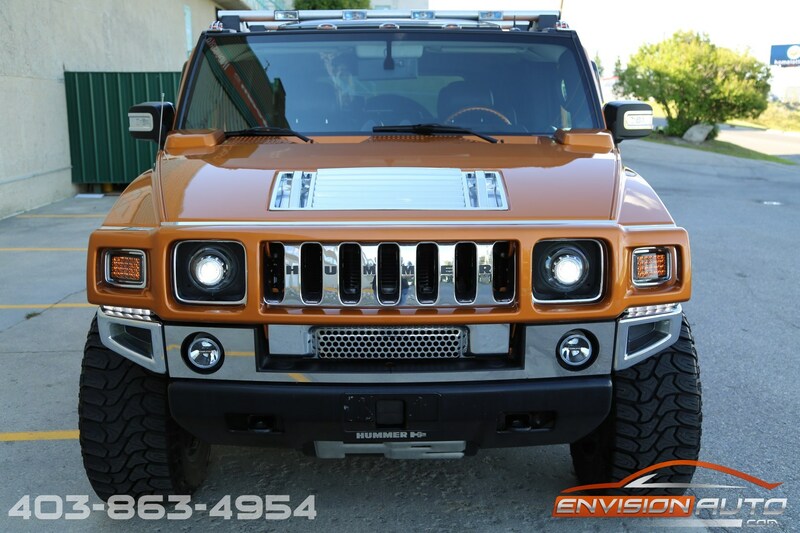 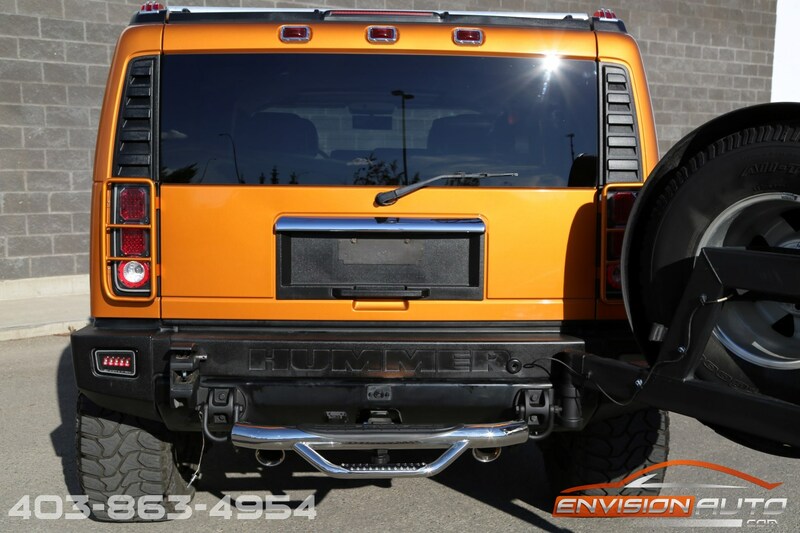 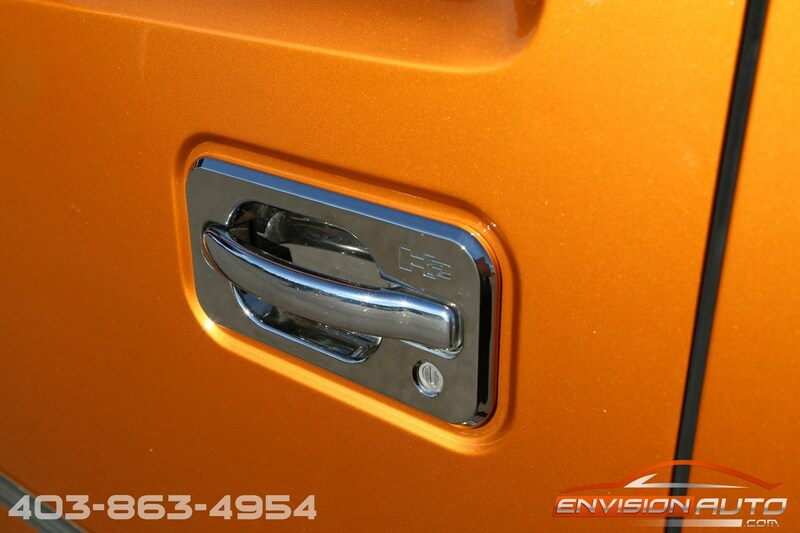 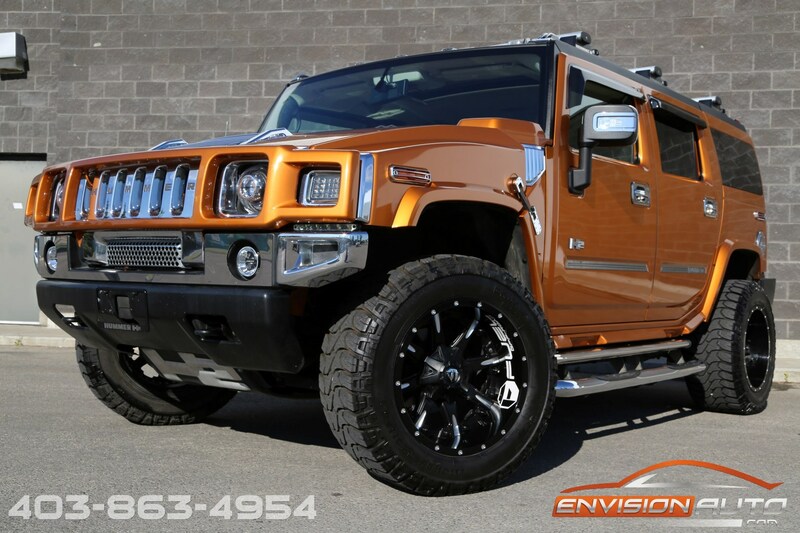 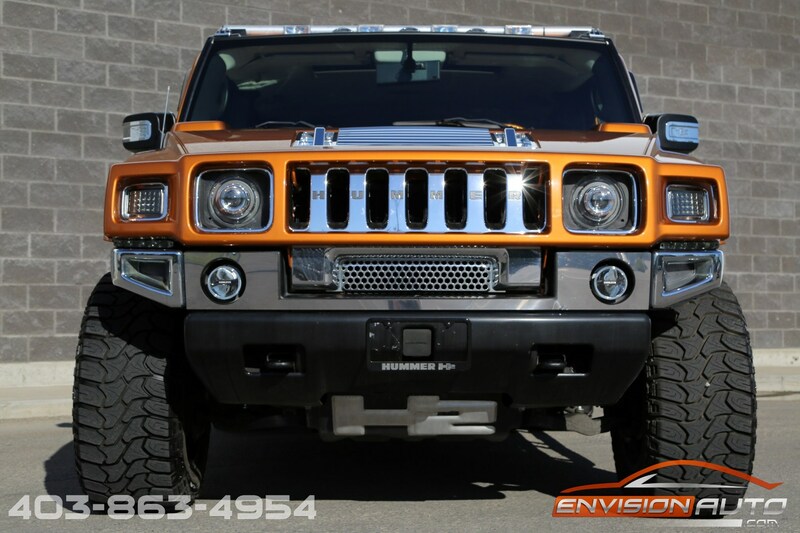 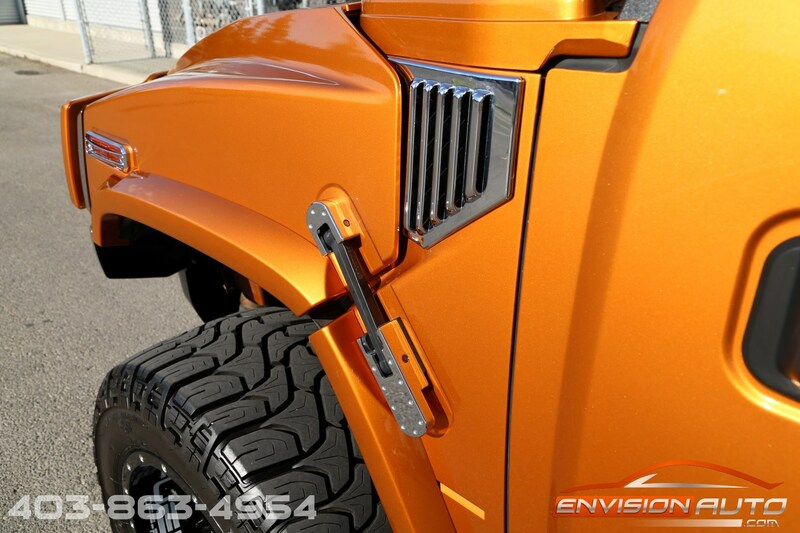 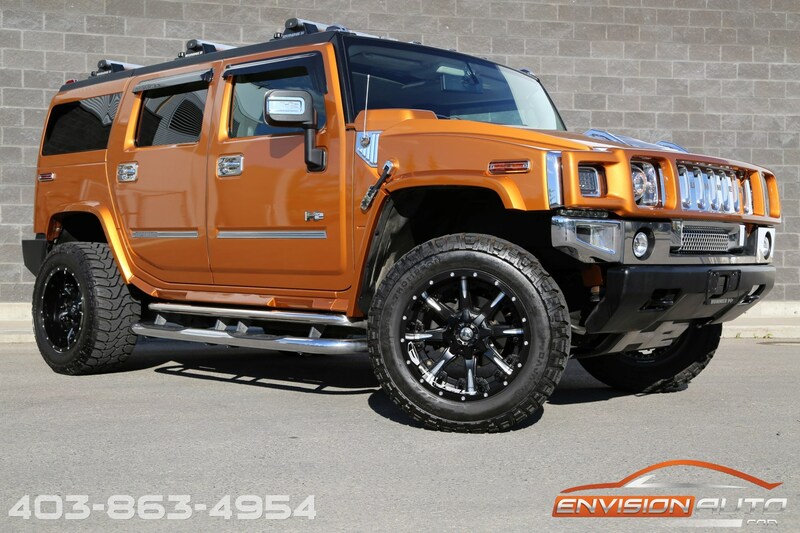 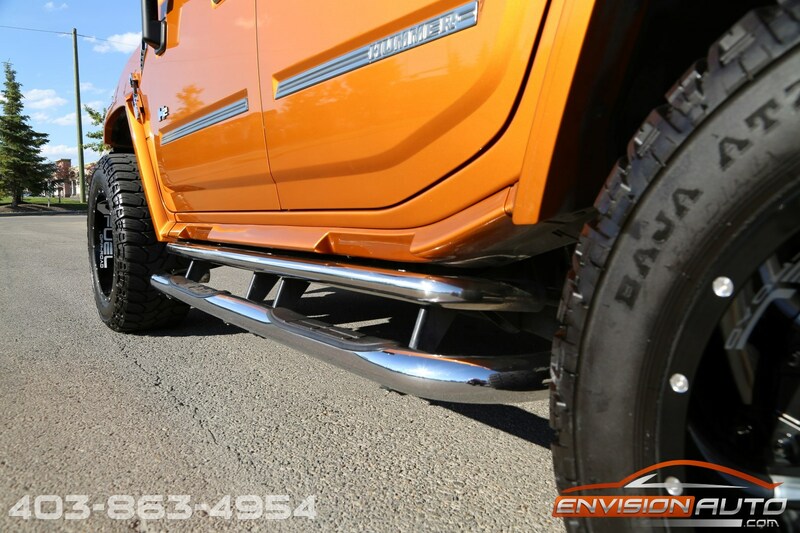 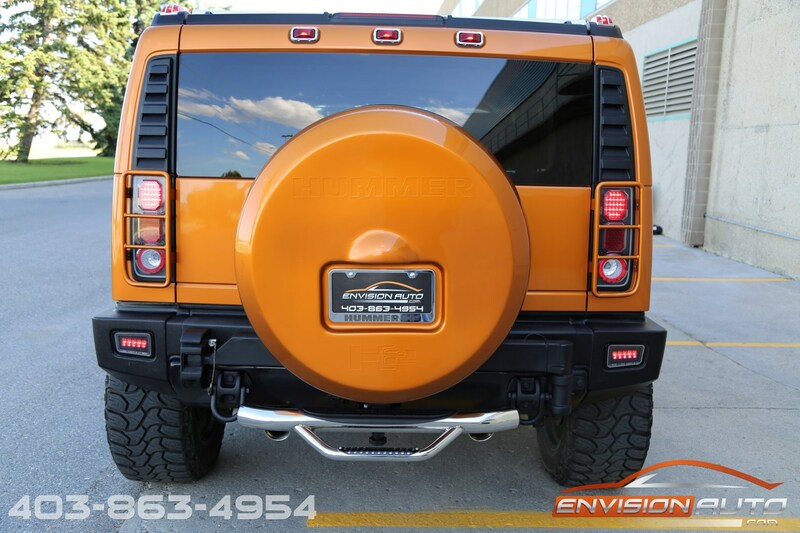 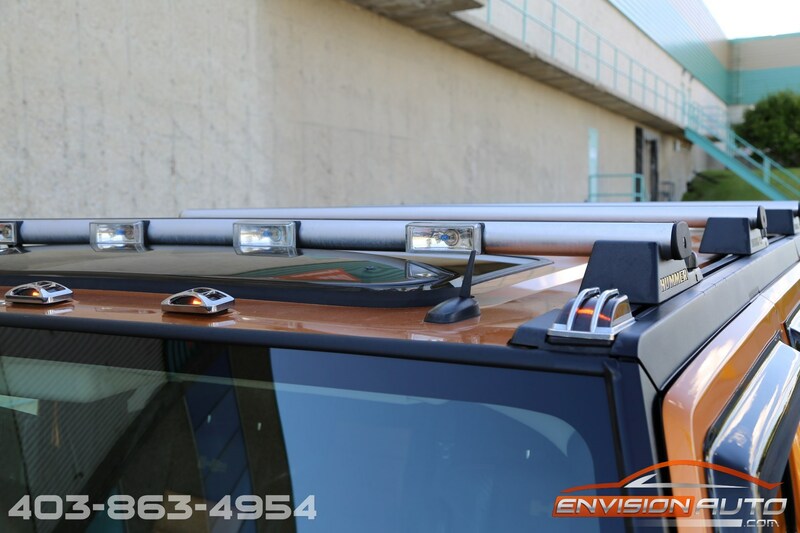 Full chrome exterior appearance package featuring running boards, marker light surrounds, fuel door, door inserts, and front chrome trim. 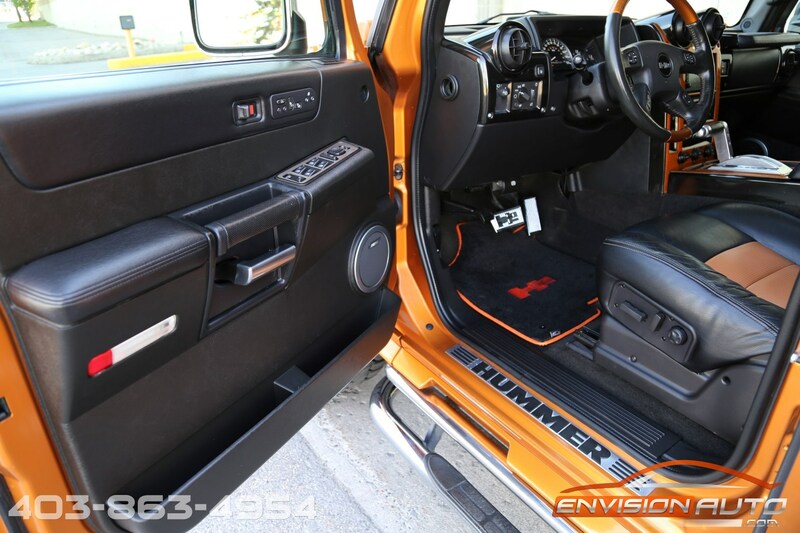 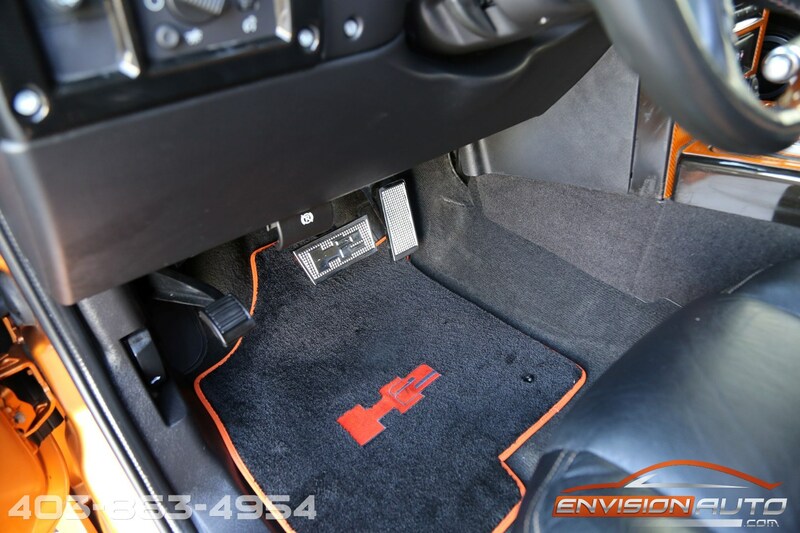 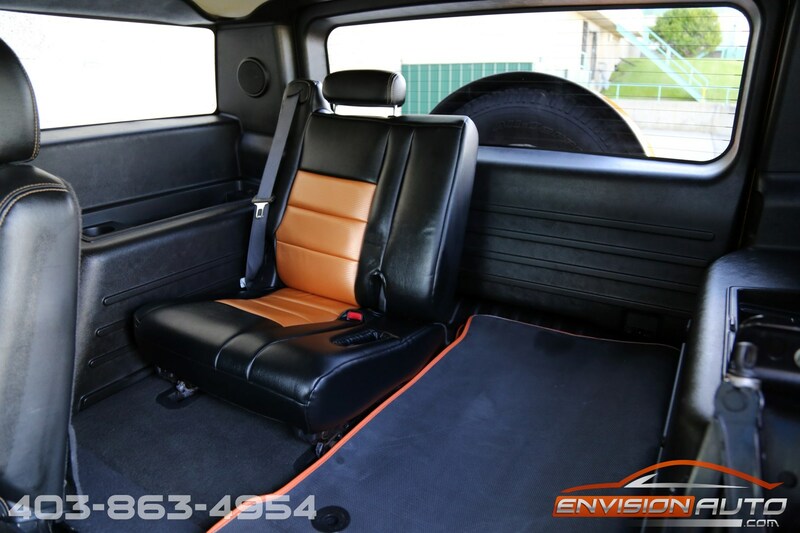 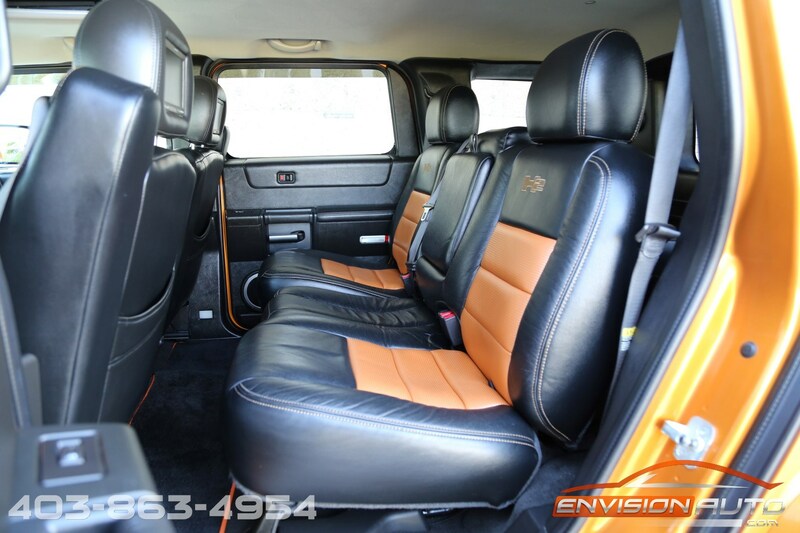 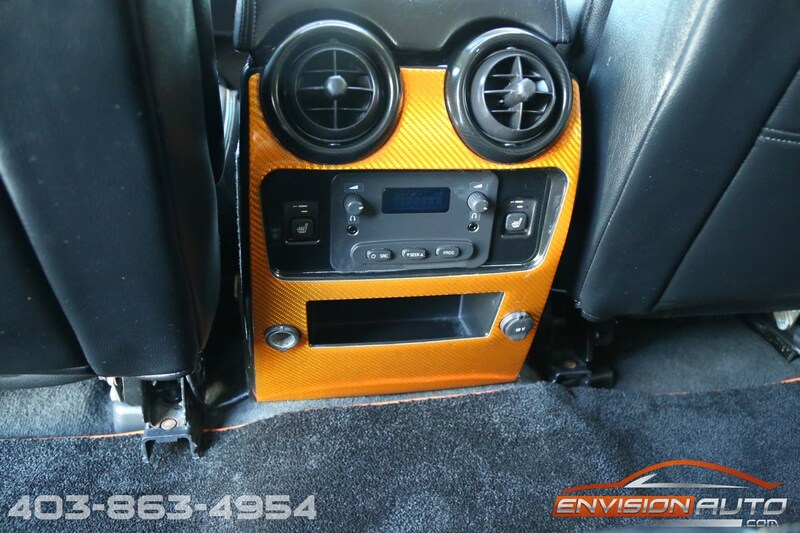 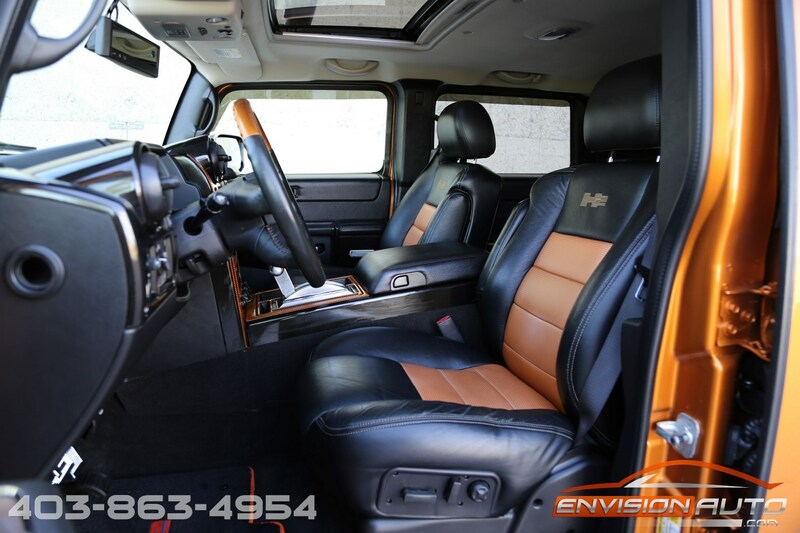 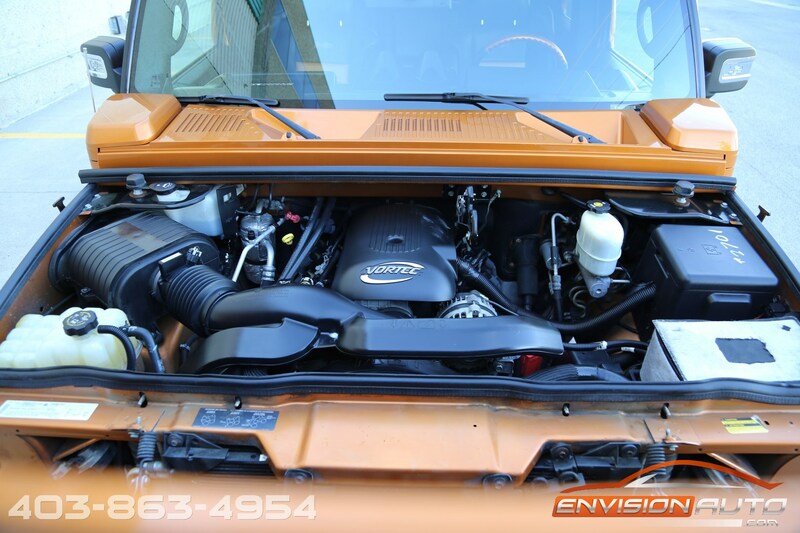 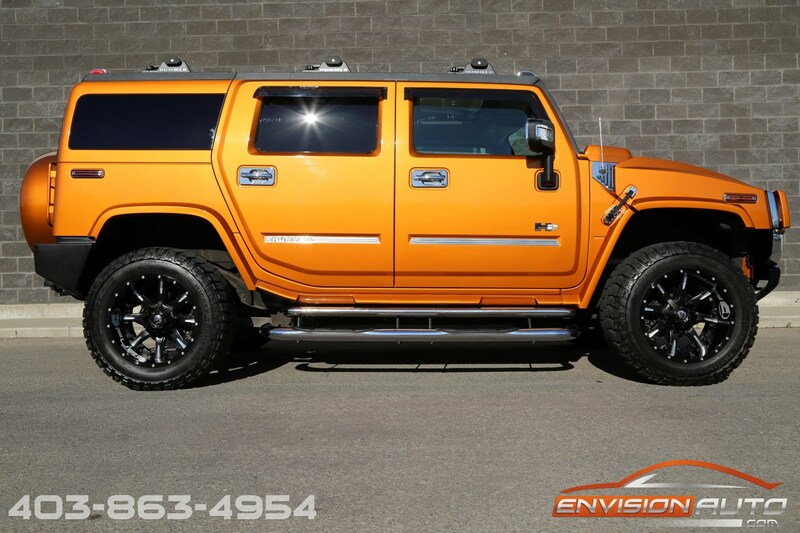 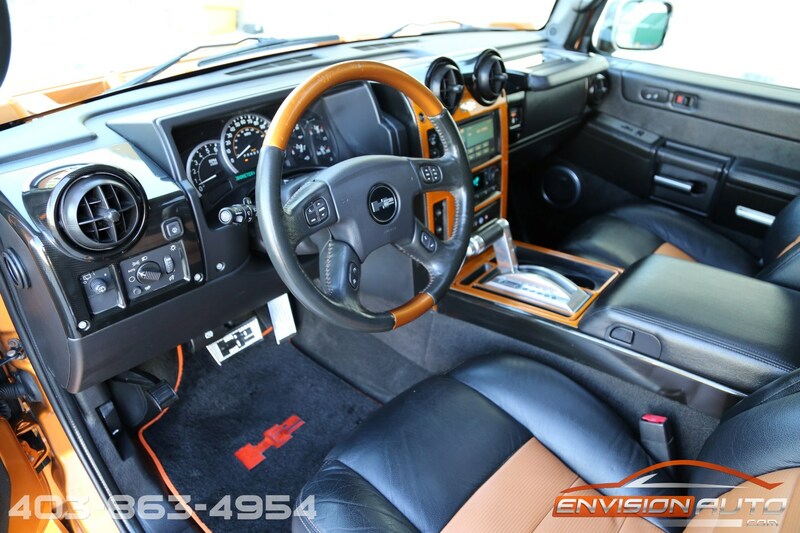 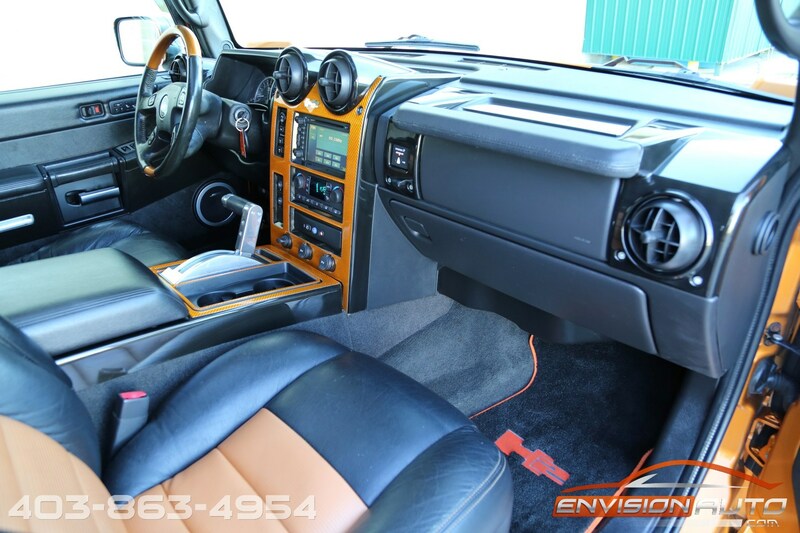 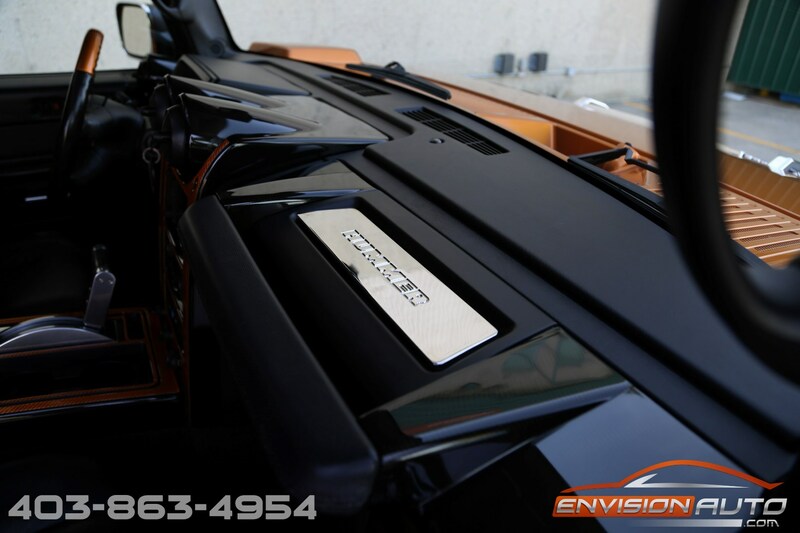 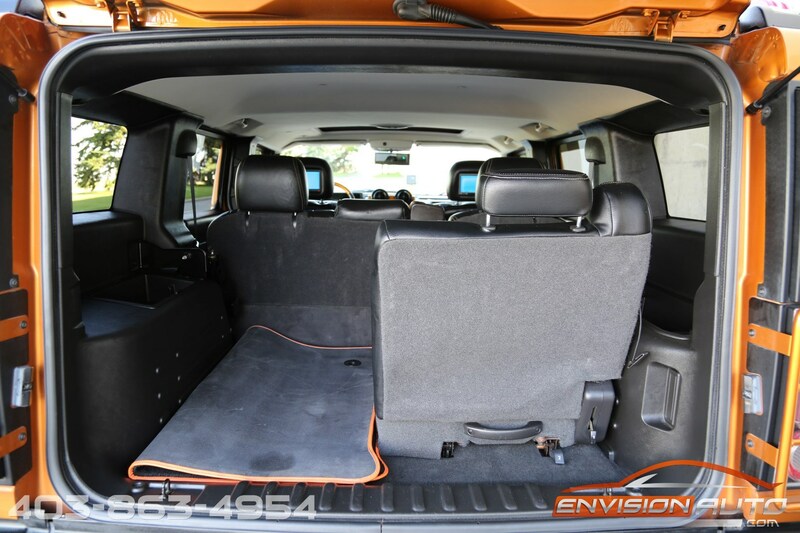 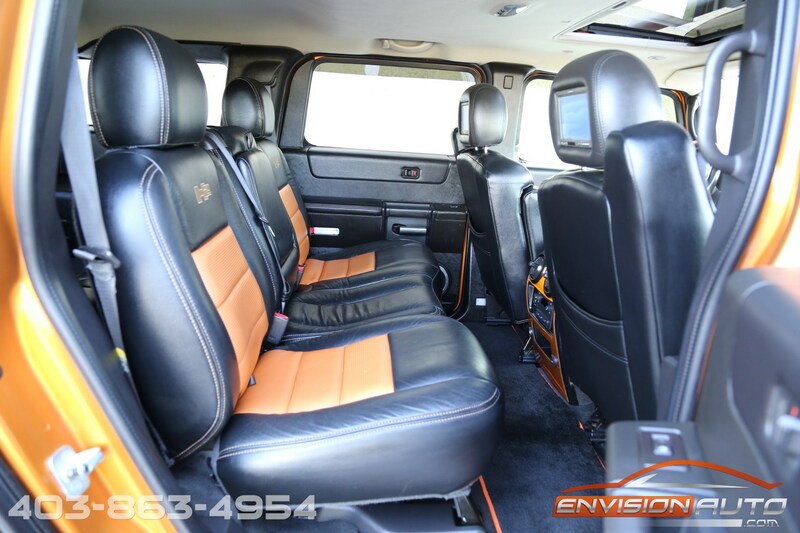 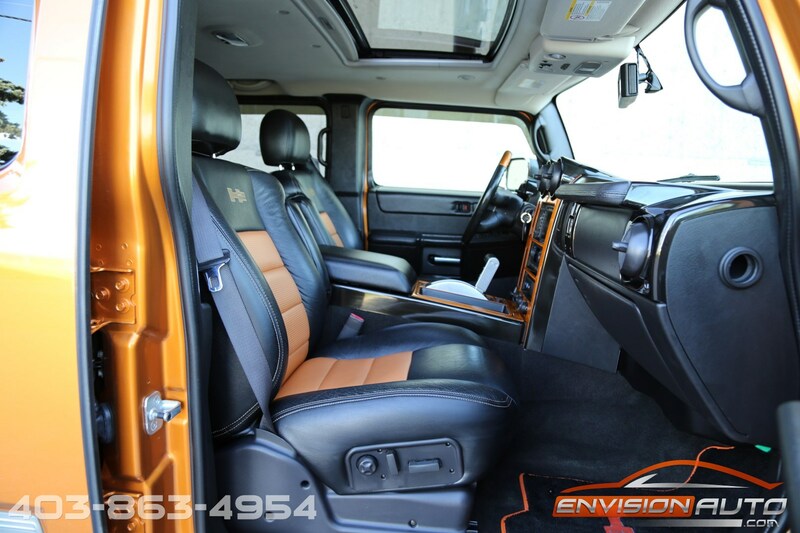 On the inside of this H2 the previous owner completely replaced the factory seats with full real leather black seats with orange center inserts – heated front and rear! 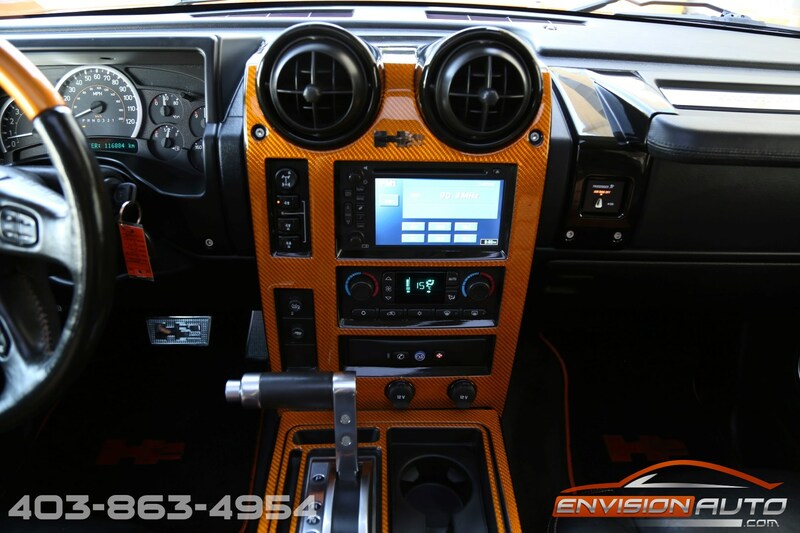 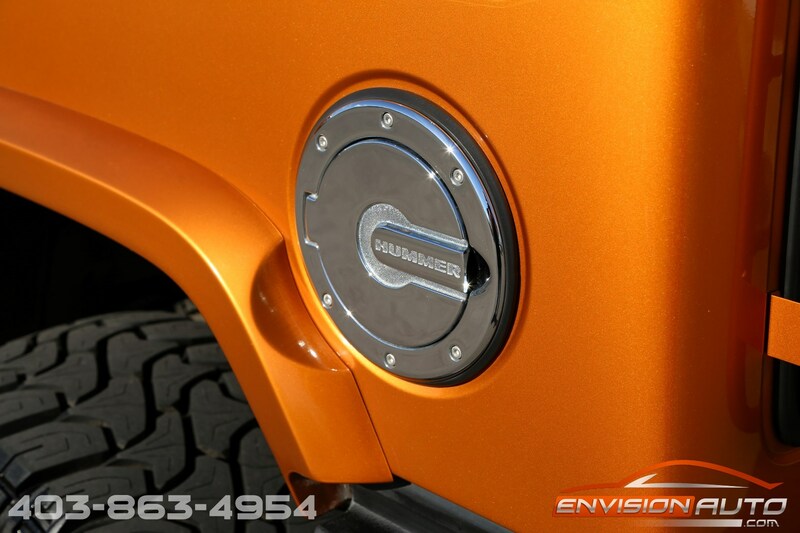 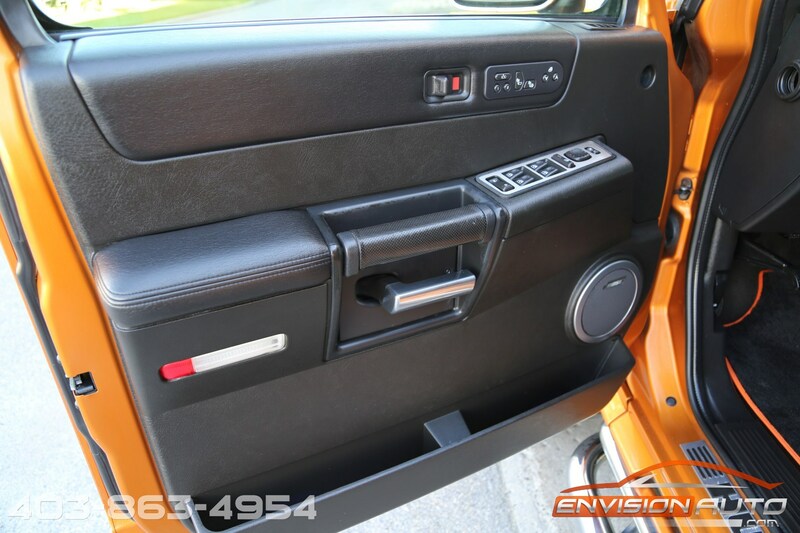 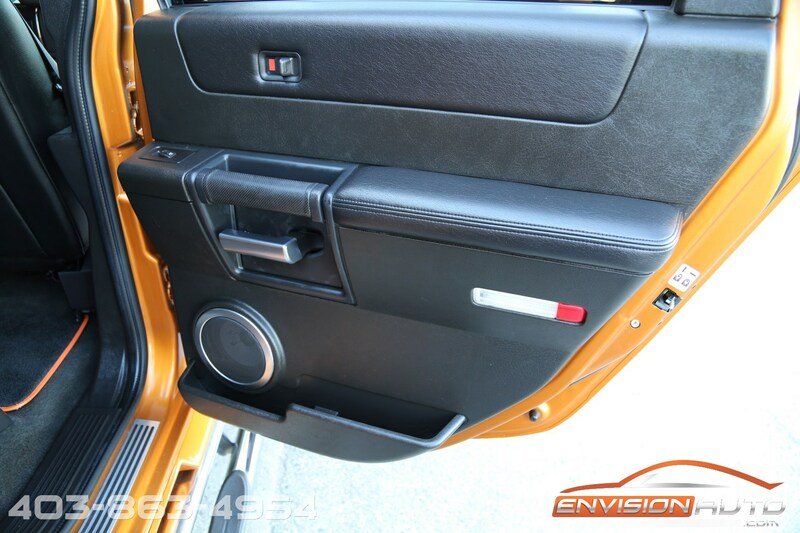 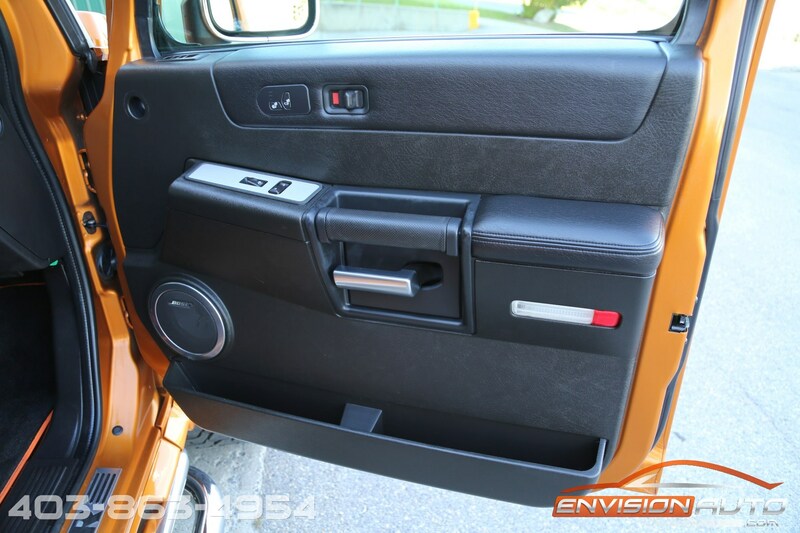 The dash and center console is treated to a custom orange finish that matches the custom orange steering wheel. 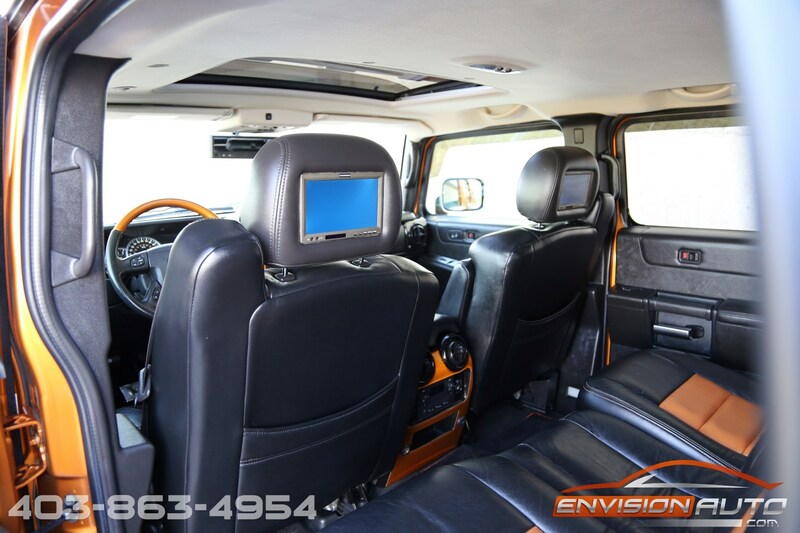 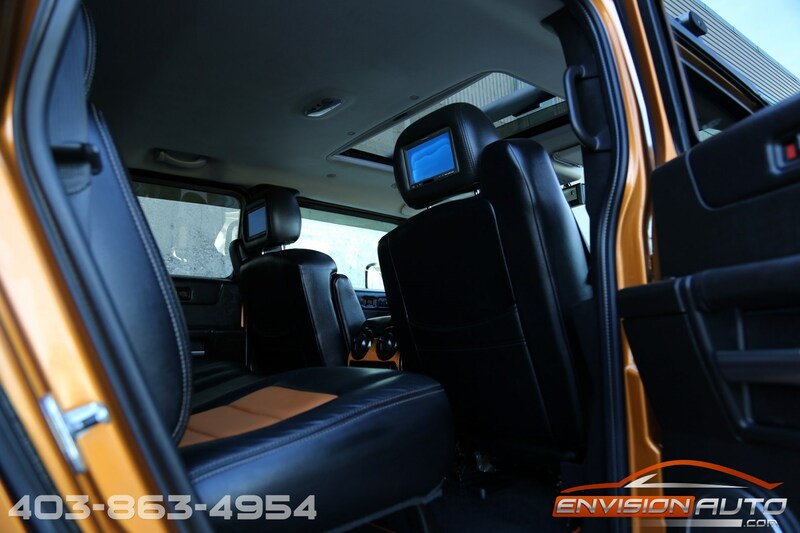 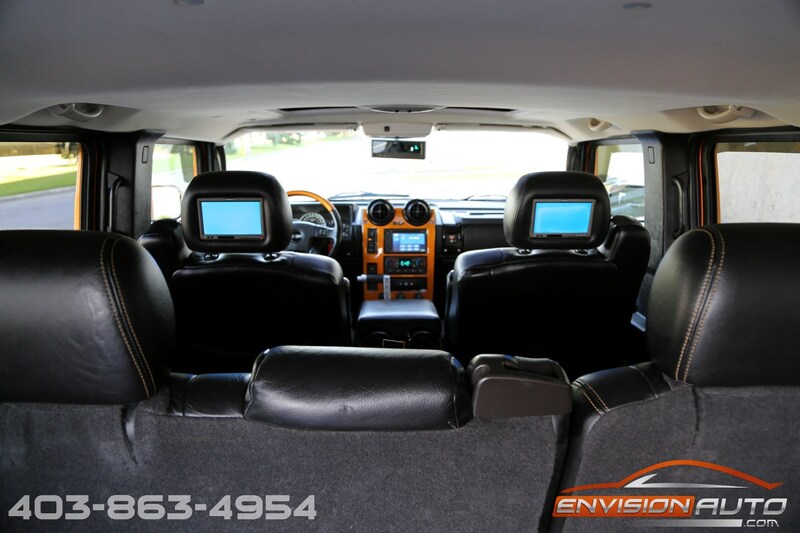 Factory options included are a huge power moonroof, factory navigation, factory reverse camera integrated into the rearview mirror, bluetooth handsfree system, rear dual dvd entertainment monitors in the headrests, third row removable seat for up to six passengers, and more! 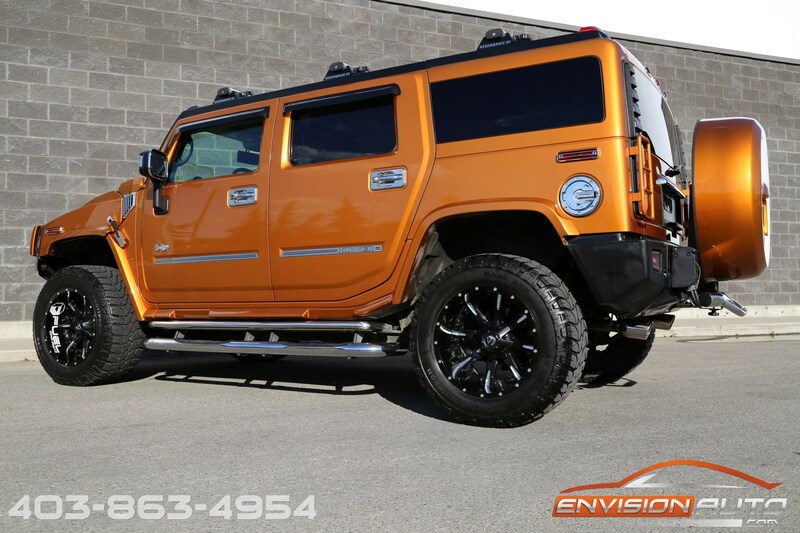 This H2 just successfully passed a 300 point safety inspection without incidence and is ready for it’s new owners for immediate possession!